what grounds for annulment and non-enforcement a losing party can raise in what countries. Perhaps the greatest benefit of the book is the inclusion of model clauses, commensurate with both civil law and common law expectations. The author explicates the advantages and inconveniences of each model clause, and clarifies the influence of each clause on the efficiency of the proceedings and the enforcement risk. 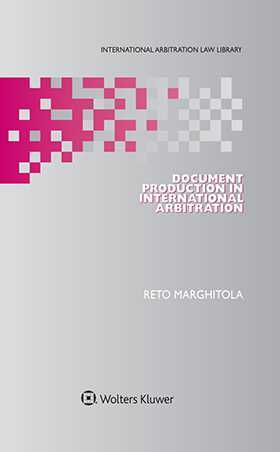 For practitioners, the book not only gives counsel a thorough overview of possible arguments for and against document production, but also assists arbitrators find a way through the jungle of opinions on the interpretation of the IBA Rules. Legal academics will appreciate the author’s deeply informed analysis and commentary and the book’s contribution to increasing the predictability of arbitral decisions on document production and showing how issues in dispute can be narrowed by tailor-made rules, thus helping to raise the efficiency and reduce the costs of arbitral proceedings. CHAPTER 2 Definition of Document Production and Distinction from Other Terms. CHAPTER 3 Purpose of Document Production. CHAPTER 4 Arbitral Tribunals’ Broad Discretion. CHAPTER 5 Interpretation of the IBA Rules. CHAPTER 6 Document Production Strategies. CHAPTER 10 Document Production Orders and Annulment and Enforcement of the Award.